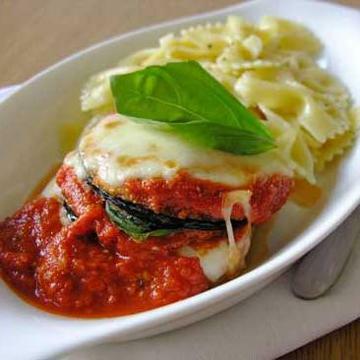 A classic Italian dish, this Eggplant Parmigiana is unique, flavorful, and a true crowd pleaser. We take tender, juicy pieces of eggplant and smother it in a delicious mild tomato and pesto sauce. Finally, we top it with the highest quality imported gourmet parmesan and mozzarella cheeses, and bake to perfection. Have someone that doesn’t fancy eggplant? This dish is likely to change their mind. (Product shown with pasta added.). Each serving is 10 oz. Prepare from THAWED state for best results.To thaw product, remove from freezer on the morning of the day of use. Product may be refrigerated up to 3 days prior to use. Individual appliance cooking times will vary. Adjust cooking time accordingly. Oven Preheat oven to 350º F. Remove plastic packaging from paper tray. Cover paper tray with foil. Heat for 15-20 minutes or until warm. Remove foil and heat 5 mins or until lightly browned. Carefully place eggplant onto a plate to serve. Microwave Remove plastic packaging from paper tray. Place paper tray in the microwave for heating. Heat for 3-4 minutes, stirring periodically to ensure even heating. Place eggplant onto a plate to serve.